Each of the 10 winners below will get 4 of the candy packs. 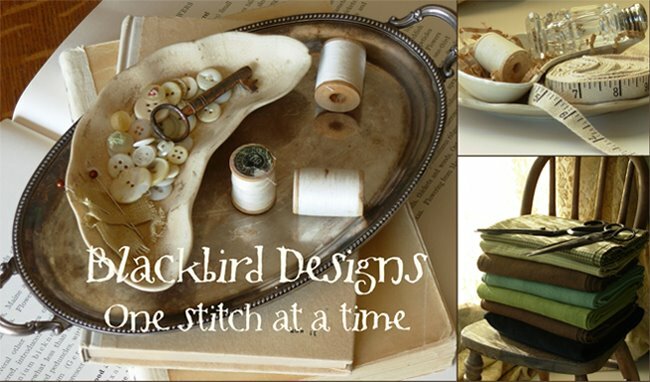 Please send your address to alma@blackbird-designs.com and I will get your prize in the mail. What a beautiful loose feathers pattern is coming to us I hope this one will come soon to me so I can stitch it. The new fabric is also beautiful. I hope it is soon in the stores. Thanks for the chance to sew with some of your beautiful " Meadow". Your Christmas sampler is tempting me to get out my X-stitch supplies again! I love the new designs - and Meadow is so beautiful ! I was fortunate enough to purchase a Fat Quarter Bundle at an extremely great price -- so good I bought two and shared with my BFF Debbie ! Also, the book arrived last week as well -- Birds here we come ! Wonderful Wonderful designs! I will keep the Christmas sampler out all year to!!! A good way to live the spirit of Christmas all year long. Love the Meadow collection as it is featured in the IN The Meadow book. Thank you for the contest. Your new patterns are great. Wonderful fabrics. I would love to win some of your fabric. Thanks. I love the Merry Christmas sampler! Thank you for a chance to win the Moda fabric giveaway. Your fabrics and patterns have always been a favorite of mine. I'd love to be a prize winner! Love the new charts. Especially the one with the house. I'll cross my fingers that I may be the lucky one. The designers below will have a special post tomorrow. Visit back here tomorrow for one more contest! Congratulations to all winners... and... thank you for organizing this great give away!!! Ooooh, I'm so happy for Lisa!!! Congrats to all the winners! Way to go winners!! what fun! Alma & Barb -- thank you so much! How exciting. My Mom's name was Alma and every time I see your name it brings a smile to my face. THANK YOU, THANK YOU !! I'm a winner! Congratulations to all the winner and thanks for hosting this awesome giveaway! How exciting! Thank you sooo much! Fun to see the winners. Sad I'm not one of them! Love those Blackbird Design ladies! Thank you Alma and Barb. I'm so excited about my prize. Cinnamon Spice and cookie recipes. What a great combo! I, too, am addicted to Christmas cookie recipes.